KidRobot x Junko Mizuno will be releasing another 8' Dunny, the Violet Soda Lady! This will be repaint of the 2015 SDCC exclusive Berry Chocolate Lady and will be available through their store and online store! For anyone in San Francisco, Junko Mizuno herself will actually be attending the release at the Kid Robot store on Friday July 31st at 6:00PM PST - 9:00PM PST and will be doing signings! Check out the official details below from KidRobot official blog! Kidrobot is excited to announce the official release of Junko Mizuno’s Violet Soda Lady 8” Dunny. Following the sold out release of Berry Chocolate Lady at San Diego Comic Con, Kidrobot and Junko Mizuno will release Violet Soda Lady 8” Dunny on Friday, July 31st. 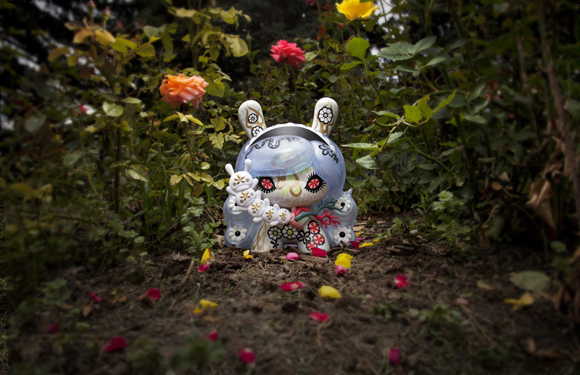 In celebration of the release, Junko Mizuno will be signing at Kidrobot San Francisco on July 31st from 6pm-9pm. “The Purple Soda Girl Dunny that I designed in 2012 was very hard to create, so I’m really happy & excited that her big sisters, Violet Soda Lady and Berry Chocolate Lady, are coming out! I hope they will find a lot of happy owners! I think of my Purple Soda Girl Dunny from 2012 as a daughter of Kuro Megami that I designed for Kidrobot Black Series. When I designed her, I was using the photos I took of old god and goddess statues at Asian Art Museum as reference. So Kuro Megami is kind of like a goddess representing my art. Purple Soda Girl and the two new 8” Dunny’s are all her daughters who have the same goddess-like feeling.” said Junko Mizuno on her inspiration for creating Violet Soda Lady and Berry Chocolate Lady. Violet Soda Lady will retail for $100 and be available in stores and online at Kidrobot.com on Friday, July 31st at 9:00AM MST.